To compensate for his weaknesses in two area he was taught by his sensei, Mighty Guy, how to open the chakra gates to increase his strength and speed but he can only use it to protect his ninja way and to protect the people he loves. He was told that he must be careful to open those gates because no one can normally survive the opening of the eighth chakra gate. To even open a single one of the gates takes hard work, sacrifice, and strong desire to succeed above all else. 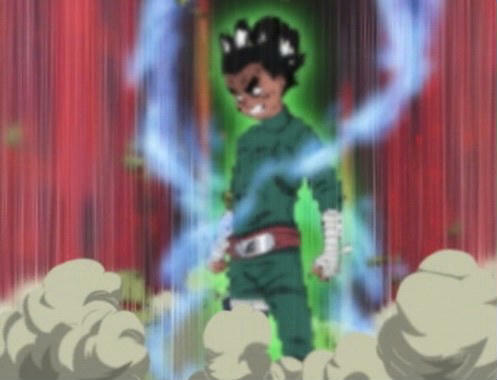 Rock Lee as a child opened five. I think we can learn something from him. I think we can learn something from the Apostle Paul as he spoke to the Roman churches.The Apostle Paul sent a letter full of knowledge that should have bettered them for sure but also better us as well. When I think about the scripture above I thought about how Rock Lee had to persevere with a strong positive attitude full of hope that he can be the greatest taijutsu user and finally win the heart of the girl of his dreams, Sakura. His struggling to succeed in being able to stay in the same league as the other students only using 1/3 of the skills used in the ninja world caused him to develop character. And his character developed him to hope. And no matter what anyone says or does to him he keeps going. I related that to my own life. In my heart so many times I feel like a failure. So many dreams and goals and I have only scratched the surface of them. I was meant to write a book and yet the funny thing is I figured a beginning and end and couldn’t think of a middle. I went to school to be a systems/business analyst and yet the only thing that the company I work for think I am good for is doing dispatch work. I won’t get into relationships, but I have failed in that department many of times for various reasons. Yet in all of that I look at the Bible and something stirs in my spirit. No matter of all the grief I endure I persevere. Which builds my character and I am filled with hope knowing that God is not done with me. I wrote a little bit about myself because I want people to know who are reading this right now that you may be doing worse than me or better but do not give up. Do not lost hope for a better future and a better tomorrow. Stay focused on God and he will bring you to the place you need to succeed. He knows your aches and struggles and you will not be in that position always. Sometimes hope is all you have and hope is what you need to get yourself in motion to do the great things in life. Heavenly Father, I thank you that you have shown me what I need to a better and stronger person. That if I could just keep pushing through my suffering and build my character you will be there with me and for me. Forgive me for all of the times I have failed You in my battle of trying to win this game of life under my own strength and knowledge and not depending on yours. Forgive me for all the hurt I have caused the people closest to me when I couldn’t understand why my life wasn’t moving in the direction that I wanted. I didn’t let you direct it as I should have a placed you first. I also pray that those people will forgive me one day as well. Thank you for being the one constant in my life that have yet to change and I pray that you stay with me always. In Jesus name, Amen.